Polish leaders welcomed U.S. troops to their country Saturday, with the defense minister expressing gratitude for their arrival and calling it the fulfillment of a dream Poles have had for decades. The ceremony in the western Polish town of Zagan comes some 23 years after the last Soviet troops left Poland. It marks a new historic moment — the first time Western forces are being deployed on a continuous basis to NATO's eastern flank. The move has infuriated Moscow. The American deployment includes an armored brigade of 3,500 American troops from Fort Carson, Colorado. It comes in reactions to Russia's annexation of Crimea from Ukraine in 2014 and its backing of separatist insurgents in Ukraine's east. Polish Prime Minister Beata Szydlo welcomed US troops to her country at a formal ceremony Saturday, saying it was a "great day" that would help ensure Poland's security. Some 4,000 US soldiers have been deployed as part of troop rotations to Europe that the Pentagon has said are intended to bolster ties with NATO allies and send a clear message to Russia. Russia has criticized the continuous deployments as a threat to Russian security. 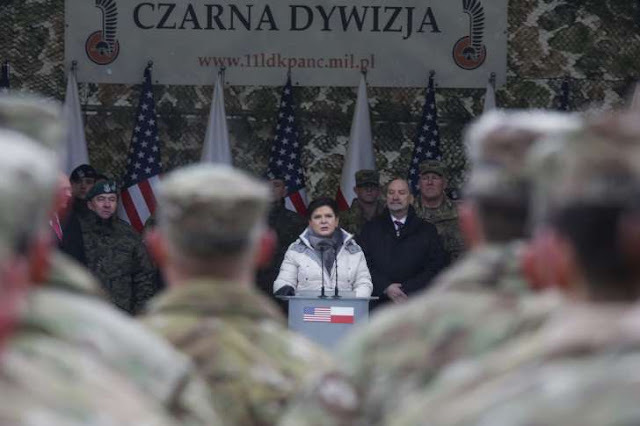 "It's a great day today when we can welcome, here in Zagan, American soldiers who represent the best, the greatest army in the world," Szydlo said at the ceremony in the snowy western town of Zagan. Speaking after the Polish leader, Paul Jones, the US ambassador to Poland, said the troops arriving in Poland were "America's most capable force," embodying an "iron-clad commitment" to defend NATO allies. Polish Defense Minister Antoni Macierewicz said the US troops would help ensure "freedom, independence and peace in Europe and the whole world" and that Poland was proud of "joint efforts that guarantee the security of Europe and of the eastern flanks of NATO." American soldiers "stand united on Polish soil to deter and defend," said Maj. Gen. Timothy McGuire, deputy commander of US Land Forces in Europe. He added that the troops' arrival was a "concrete sign of the continued US commitment to the defense of Poland and the NATO alliance." The 3rd Armored Combat Brigade Team of the 4th Infantry Division "is a highly capable and ready force with the best equipment, leadership and training of any combat force in the world," he said. To maintain combat readiness, the soldiers will conduct "realistic exercises" with allies in locations across Poland and Europe, McGuire added. A convoy of US troops and military equipment crossed the border into Poland on Thursday, having arrived earlier in the week in Bremerhaven, Germany. Having assembled in Poland, the brigade combat team, deployed from Fort Carson, Colorado, will disperse across seven locations in Eastern Europe for training and exercises with European allies. It will serve as part of a rotation of American military assets in the region and is part of an effort to demonstrate the US commitment to European allies in the wake of Russian President Vladimir Putin's intervention in Ukraine, according to Lt. Gen. Tim Ray, deputy commander of US European Command. Deploying the troops and military hardware is the latest in a series of moves by the United States to ramp up its land, sea and air presence in Europe against a backdrop of concern over potential Russian aggression. Kremlin spokesman Dmitry Peskov told journalists on a conference call Thursday that Russia's response was a natural reaction to an increase in military strength by a neighbor. "We see it as a threat to us. This is an action that threatens our interests, our security; moreover, this is a third nation (apart from Russia and Poland) that is increasing its military presence near our borders in Europe, and it's not even a European nation. "One thousand or 10,000 -- we're talking about the increase of military presence. There's nothing to add." US President-elect Donald Trump has said that he would like to improve US relations with Russia. But Polish Foreign Minister Witold Waszczykowski warned in an interview Friday with Poland's RMF radio that any warming of the US-Russia relationship should not come at his country's expense. Posting on Twitter, Waszczykowski said he had spoken with Trump's advisers in the United States. "Americans think about the world and relations with Russia much like we do. We have nothing to fear," he said. Poland and other NATO allies in the region are keen to show their support for the US deployment, which comes at a time of uncertainty over the incoming Trump administration's commitment to the trans-Atlantic alliance. During the campaign, Trump repeatedly questioned the utility of NATO and its members' financial contributions to the alliance, which many see as a bulwark against Russia. However, his nominee for defense secretary, retired Gen. James Mattis, a former supreme allied commander of NATO, voiced unequivocal support for the alliance in confirmation hearings this week and said he had said as much to Trump. A significant portion of the 4,000-strong US force will be garrisoned at Polish military bases in Zagan, Boleslawiec, Swietoszow and Skwierzyna, the US Embassy in Poland said. While on a nine-month deployment, the US troops will carry out training and exercises in Poland, Estonia, Latvia, Lithuania, Romania, Bulgaria and Hungary, the embassy said. "We're here to deter any aggression that would threaten peace and security in this region," said Col. Christopher R. Norrie, commander of the 3rd Armored Combat Brigade Team, 4th Infantry Division, in a statement. The US troop deployment to Europe was agreed to following NATO summits in 2014 and 2016 dominated by deep concern over Russia's increased assertiveness and military power. Russia's annexation of Crimea in 2014 and the war waged by pro-Russian separatists in eastern Ukraine have particularly unnerved NATO members in Eastern Europe and the Baltic states. 0 Response to "Poland welcomes thousands of US troops"